It doesn’t take many clicks through the website for Doni Guitars (www.doniguitars.com) to understand why the luthier can call his website the The Home of the Rebel Bass. From a custom NES Paul for you old school Nintendo fans to the 6-string Wishbone straight out of a Star Wars film, it’s easy to see how Doni has gained attention and admiration from musicians such as Tom Blankenship of My Morning Jacket and, most recently and most notably, Ben Burnley of Breaking Benjamin. As some of you may know – and if you didn’t, now you do – Breaking Benjamin is touring Europe for the first time (many thanks from me to the Queen Mary 2 for getting Ben, Shaun Foist (drummer) and some of their crew over safely, since Ben will not fly). 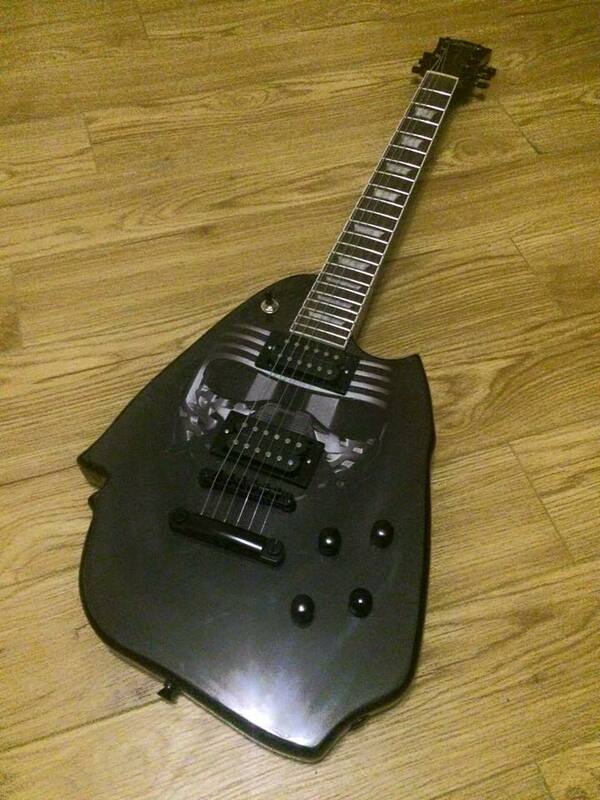 For their first ever rendition of the Imperial March played outside of the continental United States on May 27, 2016, at London’s legendary Koko Theatre (for their kickoff show of the Europe tour), Benjamin himself gave Doni the moment of a lifetime when he ripped out the familiar tune on his custom-made, one-of-a-kind Kylo Ren guitar, made by hand by Doni himself. Not only did this concert make rock and roll history for the band, but it made Doni a kind of overnight success via social media, and the posts about his guitars bounced across my newsfeed, starting, seemingly, from the very last note of the show. Doni’s name was everywhere on my feeds; it was clear something special had taken place across the world from me. The story caught my attention, so I knew I needed to sit down and talk to the Mad Scientist himself, Doni, about his artistic beginnings, his current works in progress, the moment at the Koko where he saw his guitar being played, and what the future of Doni Guitars holds. As you’ll be able to tell from the interview, Doni truly has the world at his feet, and the sky is the limit for this talented, humble luthier. First of all, thank you so much for agreeing to talk with me. As soon as I saw the stories, I knew I wanted to talk to you myself. So, I know you make furniture and even had a hand in creating a house!! Tell me how you got started with woodworking, more about your furniture, your design for your house, etc. How long have you been crafting your own designs? Ah yes, the furniture! That basically came out of necessity more than anything. I had this space in my bedroom to put a wardrobe but could not find a wardrobe the right size for it. So, at that point, I’d already considering making it myself. But, at that time I also had a bearded dragon as a pet and had already considered getting her a bigger vivarium to live in. I did a little research online and found that building vivariums was more common than I thought. So, at that point, I thought that if I’m going to building this vivarium and a new wardrobe, I might as well go all the way and build one entire unit for everything. So, that’s precisely what I did. I no longer have the bearded dragon (was called Freddie after Freddie Mercury, who is actually my idol! ), so the vivarium is gone, but that space then became more of a workstation area. It didn’t stop there either; I’d done everything in my bedroom except the bed. Now I always thought it cool to see beds with TVs in those boxes at the end, but rather than get all mechanical and build a steel frame and so forth, I just went and built the bed frame (with custom made headboard) and then built a quite substantial box structure at the bottom of the bed which has a 40″ flat screen TV fixed to it! On the opposite side is shelving for PS4 games, CDs/DVDs etc, but my computer desk also got custom built by me and is attached to it as well. Quite the project, but thoroughly enjoyable! As for the house, I didn’t design or build it myself, but I was the only person that installed the electrics within the entirety of the house before any of the upper floors were even complete. I used to be in the building trade, more so in electrics and carpentry, and I took a lot of my building education from my father and his close friends, so it fell within that part of my life. But, it was the biggest house I’d ever stepped foot in at that point, and aged just 17, it was on me to get it all wired up! Pretty daunting for most people, but I went straight at it with a clear vision of what I was doing and where. Though I will say that the drawing that was given to me of where certain electrics were going was lacking in a big way (most rooms had just two plug sockets noted, for example), but I knew this house was going to have the latest tech, and so I liaised with the site manager and house owner and told them what I thought for each room, and that was it: all agreed and onto getting all the cables in. I still go past that house now and again and always look at it with immense pride at what I achieved there, not just because of my age at the time, but also that for such a big house (5 bedrooms, all en-suite, games room, pool room, you name it!) it was all done within a matter of four weeks, all by me. Though I will say, only last year I needed to get myself into a bigger workshop. That I did design and build myself whilst still building guitars at the same time – which made for a pretty cool juggling act! But, I’ve now been in the new workshop for a good 9-10 months, and it’s perfect in every way for what I need it to be. Many people have seen it and commented just how great it looks, and how they’d love something like it themselves in their gardens and so forth! Though, I’d imagine not quite on the scale I built my workshop to given its grand size! That is incredible. Your talent seems boundless!! How do you come up with designs for things the way you do? Your eye for design is very unique!! I seem to have always had a creative spark within me that just yearned to do things differently, but when it comes to the guitars, it really does become something else altogether other-worldly! I was always doodling through my school years, and there was even one art project where we had to create a portrait of a classmate, but try and mix a front portrait and a side portrait into one image – the kind of thing which would go viral on the internet these days for messing with people’s minds! So all my classmates are picking out who they’re going to draw/paint, and I just sat there and said, “I’ll do a self portrait; I’ll do me”. The thing is, everyone else worked from a photo of their chosen person, but I just did mine from memory. It ended up being that good, the art teacher kept it for himself. But, with the guitars, it really just needs a starting point, and then almost immediately within my head I can see the finished article. I’ve even done that whilst out and about; I could be in a toy store or something, and I’ll randomly pick something off the shelf and mumble to myself where the neck would go, the pickups, everything! I try not to go into toy or model stores that much these days! Wow, that’s amazing you can do that. I’ll have to send you some photos of my kids’ toys and see what you come up with! Haha. So, how did guitars fit in the mix with the furniture? When did you start building them? What was the first one? Do you have it still? Do you actually PLAY guitar? I’d been toying with – and learning all about – guitars for a number of years prior to actually building one from start to finish, but it wasn’t until late 2013 when that happened. It was then on my birthday in January of 2014 that I decided to post a seemingly innocent photo on Facebook of the Rebel Bass and Solo ST (the Stratocaster version) that me and my father had built simultaneously. Within 24 hours, that one image had gone massively viral. It was at that moment I knew there was something there, and given my unwavering entrepreneurial spirit, I decided to run with it! However, I was still unsure of what they’d actually retail at, and so as a test, we put them both on eBay to see what would happen. They went for fairly good money, but I then had someone message me after saying they’d missed out on the auction and would I build one for them at the same price it sold for. Naturally I said yes, and actually hand delivered it to them…and so the train rolled on from there! Ironically, much like Leo Fender himself – the man responsible for the world’s first ever mass produced electric guitar – I don’t play. I am in the process of learning where time allows, but I have a few extremely talented guitarists in my network, and so if ever I need to do a showcase or a small video, I always have someone willing and ready to step in and show the world just how good my guitars really are! Eventually I will do it all in-house, but that’s a long way off at the moment. Incredible. I’ve always wanted to play, and your designs make me want to even more. 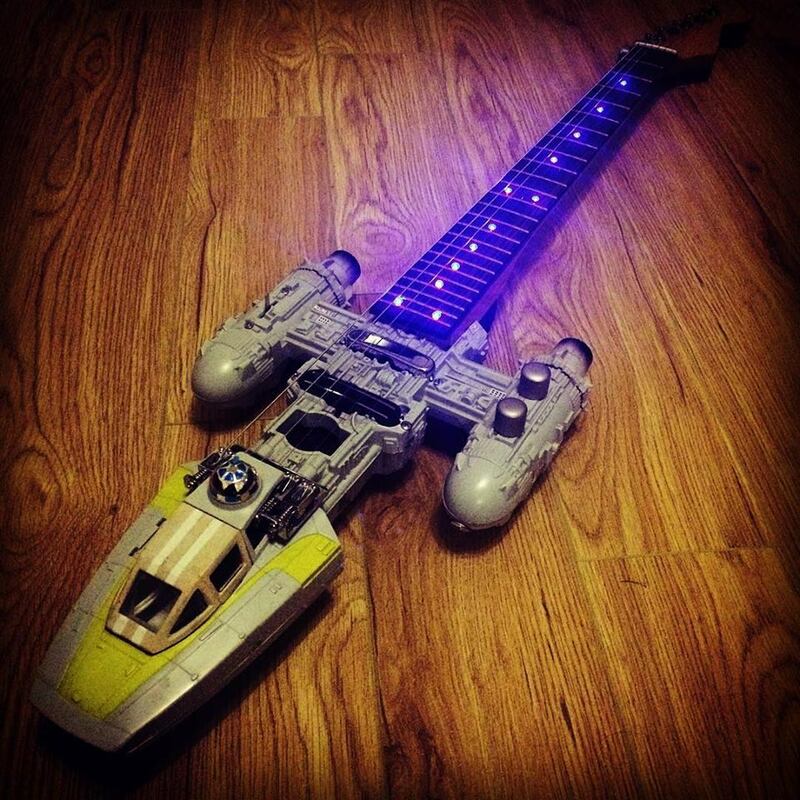 You said your dad had asked you about the Star Wars guitar potential. Are you both big fans of the franchise? I know I need to up my own geek game a bit when it comes to this, so tell me about your own. How long have you been a fan? What is one of your first memories of Star Wars? How deep does your geek bone run for this? We’re both massive Star Wars fans. My father remembers the original trilogy well, but I wasn’t born at that point, and so I had to wait for the prequel trilogy to be released before the buzz really hit me. My father introduced me to the original trilogy at a very young age and I loved them immediately and could recite them word for word and we’d watch them all the time together, but then the prequel trilogy landed with The Phantom Menace, and that got me hooked in a big way from the buzz that was generated around that time (1999 that was!). For the past four films, my father and I (and later on, my brother and my nephew) have kept up a small tradition of all seeing the newest film at the cinema together on opening day, and that’ll continue for as long as we get new Star Wars films. Though now we have Disney at the helm, they have said that there’ll be Star Wars films for as long as the fans keep wanting them… YES! Incidentally, I didn’t get many Star Wars gifts as a child, but from the moment I built that first guitar, it’s an almost guarantee that I get a Star Wars gift of some kind for every birthday or Christmas… so I really am in my element these days! Gifts are never too late, as far as I am concerned! I know quite a few other artists have hit you up for your custom pieces. They call you the Mad Scientist because of your ability to see a finished piece down to the volume knobs…. Where do you think you get this from? Do you just KNOW these pieces so well that designing them becomes second nature? I actually don’t know where it comes from, the vision that is, but I’m thankful I have it because it allows me to be the Mad Scientist, the creative genius. I’ve always taken a shining to odd guitars, such as the late great Prince’s famed Symbol guitar, so I’ve always been accustomed to axes that don’t fall into the “normal” category and so perhaps that has played a part. And, though never trained as such, I have always dabbled in graphic/creative design and am the go-to guy when it comes to Photoshop for a few people. So, this certainly helps in making these designs come to life and not just sit on a piece of paper. But I’ve seen, built, and handled that many guitar parts that I invariably know precisely where they need to be, where they’ll fit, how it needs to go in relation to whatever shape I’m working with at that moment; so yes, it really is second nature! You say that, but already I see a guitar painted white with chosen text handwritten on top, with the addition of an actual pen/pencil fitted to it (out of the way of playing, of course). Or, better yet, stick with the white theme and handwritten text, and add a few ink blots here and there, and then have the bridge of the guitar be a tremolo bridge, one of those that has a handle bar sticking out from it. But instead, sculpt that bar into a quill instead! Anything is possible! I don’t know how it happens! But, I actually do love the quill idea. That would arguably be the most elegant guitar ever made. The hardest part would be choosing what text to use! I may actually bring that idea to life! But, I have plenty to get on with at the moment…. Well, if it happens, remember me, please. Haha. So, Breaking Benjamin. My personal favorite band of fourteen years and running. How did you get the honor of creating the guitars for Ben Burnley? I know you’ve made him four, so tell me all about how that all came to be? My proudest achievement bar none! Seeing with my own eyes in my own country, Ben rocking out the Imperial March on the custom Kylo Ren axe I built for him not too long ago. I have the biggest smile just thinking about it! But yes, it was March 2015 when Rhiannon – Ben’s wife – contacted me through my Etsy store inquiring about getting a Solo ST for Ben’s fast approaching birthday. It’s probably a good thing that I work alone because when I first saw that message and she said who she was, I was a complete wreck! I’ve been a Breaking Benjamin fan since the We Are Not Alone album in 2004, so this was huge! So, I fulfilled that commitment, and Rhiannon stayed in contact with me throughout the remainder of that year until she decided to want a new axe for Ben in time for Christmas. We discussed the possibilities, and I drafted up a design of Darth Vader; however, she then sent me some images from a party they’d organized around Halloween, a Star Wars themed party where everyone went dressed up. Ben went as Kylo Ren in one of the best costumes I’ve ever seen, so that gave me the idea of switching to Kylo Ren with the mask giving a far greater look to a potential guitar. The deal was sealed on that. It nearly went all horribly wrong though when in late November, I had a rather unfortunate and rather messy accident in the workshop which – to sa ve the gory details – saw my thumb and my industrial bandsaw get acquainted. Suffice to say, I had to have emergency corrective surgery to fix damaged nerves and tendons in my left hand, and I was out of action for 6 weeks at least with Christmas fast approaching. Thankfully, my father offered his help if I showed him the ropes (because I make them very different these days to how we made the first few), and with my father being the man responsible for teaching me all about building in general, I had no hesitation in accepting his offer. Better yet, my brother is a qualified carpenter as well, and he also stepped in to help and so together, we still managed to make a lot of people around the world incredibly happy when they opened their Christmas presents! Needless to say, Kylo Ren had to be put back until I was fully operational again, but Rhiannon was adamant in having something for Ben. So we struck a deal which meant two more guitars – a Solo LP and a Y-Wing – would be with her by Christmas. As a gesture of my appreciation for her understanding, I personally sent over a high end figurine of Kylo Ren for her to give to Ben on my behalf – though it was also a little nod to what was coming later on, his Kylo guitar! That seems like a dream come true, almost a Cinderella story for the guitar world! I noticed you are friends with Loni Reeder, Shaun Foist’s manager. How did that come about? Have any plans to make him any custom drum sticks?? Drum equipment? Anything fun for Shaun in the works? Loni is one of the nicest, one of the coolest people I’ve ever had the pleasure of knowing. I actually got to know her because of my dealings with Ben and Rhiannon and the guitars; it literally was just that. But, I’m blessed to call her a good friend these days. There’s nothing in the pipeline for Shaun yet, though I never rule anything out! You see, you say drumsticks and immediately I’m seeing colour-changing lightsaber drumsticks. Those drumsticks do exist, but not in lightsaber form, so I may need to give that some serious thought. But, I don’t know how much of a Star Wars fan Shaun is, so who knows! That said, I have had it put to me before that a Death Star drum kit would be cool, but again that needs some consideration. Well, this almost didn’t happen! It was Rhiannon that told me I’d be there, and I’d get VIP etc, but time flew by and I realized nothing had been arranged. I had already bagged tickets in the pre-sale anyway for me and my friends because we weren’t missing this show whatsoever! But, it wasn’t until nearer the time that I tried to contact Ben (and Shaun for that matter!) but to no avail. So, I spoke to Loni about it, and she got it all arranged with John, BB’s tour manager, and that was it all sorted. It was already an outstanding show to be at; Breaking Benjamin really do rock the place. So, as a fan it was already mind-blowingly awesome, only infinitely better with being side stage. But then Ben pulled out Kylo Ren and proceeded to rock the Imperial March, and well, I quite literally lost it! I had no words: speechless! I knew I’d get to meet Ben and the guys after, but to actually discuss the guitars with Ben was something else; it really was. Him saying he loved the Kylo guitar and he loved playing it was quite literally music to my ears! Best. Night. EVER! Now, let’s talk the upcoming Download Festival on June 10-12. You’re going all access again to that one, and Ben said he’d play Kylo again for you there. Do you have any hopes for that show? I know that he said you get whatever you want, so what do you hope happens for you there? Yes, it was in that same conversation with Ben after the London show that I asked if he’d be playing it at Download, and he said yes. I believe he meant that, but I know that Breaking Benjamin are restricted to a 40 minute set, and so I’ll totally understand if he doesn’t play it. In terms of all access, I will only actually be at Download Festival for that one reason: Ben and the guys. My friends and I were intending to go, but we all agreed to miss this year with us going to see Breaking Benjamin in London anyway. But, I actually live less than an hour’s drive from the site of Download, and so it’s handy for me, and I can just rock up to see the guys and then leave afterwards – though that depends on what else may happen! I’m actually not expecting much, just me and another friend (who is already going to be there anyway) to go side stage when Breaking Benjamin play and possibly hangout for a little while in the backstage area. Who knows, may meet some other musicians – for example, Iron Maiden headline that day, and their bass player Steve Harris is a lifelong supporter of West Ham United Football Club (soccer team based in the East End of London)… but so am I! So, that could be a cool starting point to a conversation that could lead to a commission from him! Yes, I’m dreaming now! Haha! But back to Ben and his Kylo Ren guitar, that could also present a little problem for me. You see, when I started the guitar business I was asked what my ultimate goal was. Without even thinking about it, I blurted out that seeing one of my guitars being played on stage at a major UK festival would be the ultimate goal. That might just happen in the next week… it’s almost as if it’s too soon! Well, nothing like seeing a goal realized when you’re still young enough to enjoy it!! Has anything like that happened to you with other artists you have made things for? On the same scale as Ben Burnley and the guys, no. But, there have been similar times I’ve met some incredible musicians and singers, and it’s all because of these guitars I build. For example, My Morning Jacket, fantastic band in their own right, but their bass player Tom Blankenship owns a Rebel Bass that I built. Better yet, MMJ played a one-off show in London in September 2015, and it just so happened that his guitar was going to be ready around the same time, so we agreed I’d bring it to the show, and I took my father along as I knew he’d appreciate the band’s music, too. Well, again we got all access passes for that, but I actually handed Tom the guitar at the sound check before the show and got to watch the guys get set for the show that night. It was an outstanding show; my father insists it is the best show he’s ever been to, but we got to hang out with the band after as well and chat over quite a few beers. Still seems surreal! But there was also Nathan Morris, one of the founder members of Boyz II Men. Now, I’d known of Boyz II Men most of my life, and I’m not ashamed to admit I do like some of their music, so again it was a big deal for me. He actually tweeted me out of the blue telling me he must own one of my guitars, and so it began! I shipped Nate’s out to his home address, but shortly after that, they were playing a show here in the UK in Birmingham which is just up the road from me. So I asked about getting in for that show, and he happily obliged with allowing me, my father, my mother, my brother, and my sister to go along and once again we all had meet and greet for after the show. But, before the show, he told me to call one of the crew on the tour when I got to the venue, and so I did. I then got took backstage to their dressing room and casually sat with them for about 20 minutes talking music and Star Wars! What was quite funny about that was Shawn of Boyz II Men actually had Star Wars playing on his iPad before I’d even walked in! I actually gifted both Nate and Shawn some guitar straps modeled on Chewbacca’s bandolier whilst in the dressing room, which they both put up on social media and told the world I was their good friend, which naturally I loved seeing! My whole family then got to enjoy the show followed by meeting Nate, Shawn, and Wanya afterwards in what was a thoroughly enjoyable night but one I’ll remember forever for having my family along with me. Plus, just before Christmas 2015, me (and my father) hand delivered a Rebel Bass to British singer, Sophie Ellis Bextor, to her house. She’d ordered it as a Christmas gift for her husband, Richard Jones of The Feeling. She was so nice, offered to make us a cup of coffee and all of that. Though it was quite funny because she wanted to hold the bass herself, but she had her newborn in her arms. Without hesitation, she handed her newborn to my father to hold and then picked up the bass to get a feel for it and talk to me about it. I’ve since taken to calling my father “babysitter to the stars”! Later this year, I’ll be going all access for 3 Doors Down & Pop Evil when they tour the UK. This is courtesy of Leigh Kakaty, front man of Pop Evil, who also has a guitar from me. He’s actually been playing it on their US tour over the past few months, and I’m lead to believe he even played it on the shows Pop Evil did supporting Rob Zombie and Disturbed. Too cool! So yeah, it’s been pretty insane to say the very least, and it doesn’t look like ending anytime soon… but I wouldn’t want it to! Wow, man. This is your time! This has truly been a whirlwind for you, and I cannot imagine a nicer guy having this happen to him. I mean, your talent is evident, and you’re one of the nicest guys I have talked to in my time here at the magazine. Has this rush of “fame” as it is found you any new business? Any new fans (aside from myself)? Thank you so much for those kind words. It really does mean a lot! It terms of new fans, for the business yes. For me personally, more and more people are starting to find out who I am and what I do, but I maintain a firmly grounded stance on it all because I know that I’m just incredibly lucky to be in the position I am and experience the things that I do. Though, I will say that it’s both amazing and unsurprising to see how many people suddenly want to be a part of your life all over again! Haha! Right, I can understand the old classmates now wanting to be chums since you’ve blown up a bit, right? Now, on a related note, you’ve endorsed the UK-based rock band, Re:Make. Tell me more about them and how the partnership started with them. I’ve become a fan of theirs online, and I really want our readers to know more about them. Their sound is super cool, and I see big things coming for them in the future! Yes, Re:Make are fantastic. Those guys really do bring happiness and quality music wherever they go. They take their inspirations from such things as gaming and anime, but they don’t take themselves too seriously and maintain that it’s mostly about having fun and just making sure everyone else does, too. The fact they make such great music is just a bonus added on top of that. I got to know them through Edd, their bass player, who is also a member of the 501st UK Garrison, which is a mass collective of people dedicated to Star Wars and whom all possess film quality costumes. They do a huge amount of charity work all over the world, and knowing Edd is part of that is great. So, with Edd being a huge Star Wars nut like myself, plus a member of the 501st, he hit me up to get his own Rebel Bass made for himself. From then on, we’ve become incredibly good friends, and I actually have more guitars to do for him based on his likes and hobbies, etc. It was with us becoming good friends that we knew an endorsement deal would be the best thing for us both, because those guys told everyone about me, and I told everyone about them! But yes, even though their main inspirations are the likes of gaming and anime, that really doesn’t define their music. Anyone that likes any form of rock music can really enjoy and get into Re:Make’s music; it really is THAT GOOD! And naturally, the guys are super stoked that you’ve become a fan already too! Maybe you should do a feature on them?! It’d be win-win for everyone! Well, I intend to keep my eyes on them for sure. I am always up for new feature artists! Send them my way, haha. Clearly, Doni guitars is something special; what do you hope for the future of your business? I see a lot of action on your website and Etsy page (www.doniguitars.etsy.com); what do you hope to come from it all? Is this your blood, sweat, and tears and your baby here? In all honesty, and I’m probably harking back to what I said earlier about maintaining a firmly grounded stance, it still amazes me just how far my business has gone in such a short space of time. It’s like a never-ending wave out on the ocean, and I had a surfboard to hand… I decided to get on, and it just hasn’t stopped rolling on and on and on with no end in sight. Admittedly, I’d tried my hand at a few little ventures because of my aforementioned entrepreneurial spirit, but they were little ventures in every sense of the word. Well, at one point I turned people’s children into their favourite cartoon characters – that graphic design background really has come in handy in so many ways! But for as long as the guitar business keeps going, I’ll keep riding the ‘fame train’ as one of my best friends keeps calling it! I know that I’m lucky in the sense that I have been able to give up working elsewhere, and I solely work on the guitars and nothing else. I know many people dream of working for themselves and being successful with it and to some I may already have achieved that, but I’m not close to it in my mind, yet. If I could go through the rest of life doing nothing but building guitars for people all over the world, then I’ll know that I’ve truly made it. However, in business terms, making the name Doni just as synonymous with guitars as the other big names out there is really where I’m aiming to take this. You are truly living the artist’s dream! What does your family think of all of this fun success? I’m sure they’re proud of you!! Yes, my family tell me almost daily just how proud they are of everything I’ve achieved so far. But I owe a lot to my family, too; not only is my father responsible for my building education, not only are my parents responsible for the man I grew to be, but the unwavering support of my family has been nothing short of amazing. That’s why I chose to take them to that Boyz II Men show, for example; it was but a small token of my appreciation to them for being firmly behind me in what I set out to do and continue to do. It’ll get better soon too, because my eldest nephew already takes after me in a lot of ways, but he’s already told his mother that he wants to take over my guitar business when he grows up and has asked me to teach him how to build guitars… he’s eleven years old! So, I guess if I can turn this into a family business, what more could I ask for?! Well, I thank you again for your time. I know you’re a busy guy, and I don’t want to keep you. Do you have any last words for our readers? Buy a guitar from me, NOW! Haha! I’m kidding, you don’t have to! All I really want to say is thank you to absolutely everyone the world over for not only being interested in me and what I do, but also for playing their part in showcasing my guitars to their friends. It never goes unnoticed; I do try and see everywhere the guitars end up online and what people say about them, and it’s always very much appreciated. … ROCK ON ETERNAL, my friends!